The increase in the number of players, the development of algorithmic trade, strengthening of the role of central banks led to the fact that the opportunities for earning, especially within the day, are becoming less. Volatility is now too small to earn money regularly by day trading. However, day trading is not rejected, in the course you are taught to move from portfolio trading to day trading and back, depending on the volatility of the market. But in total, 80% of the time will be occupied by portfolio trading, and 20% – this is a deal inside the day. The downside of this style of trading is the increased requirements for the availability of capital, as for the trade it is necessary to form 8-14 pairs so that the risk is distributed and not concentrated in several positions, as most retail traders do in day trading. In addition, money is needed to carry positions for the next day, the leverage in this case is much smaller than it is given by a broker for trading within a day. The course begins with an analysis of the historical volatility of the instrument at opening and closing prices for the day. It is necessary to understand whether it is possible to earn money in an instrument or not. If it sleeps or not. The distribution of daily profit is made on the basis of data that can be collected in the public domain (the course is entirely based on the analysis of data from open sources). From statistics it is clear how many percent can be made (and with what probability) when buying an asset at the opening and selling at the close. Also, it is important to calculate the potential profit considering the commission. It may be, for example, that if the ratio of profitable and unprofitable trades is 1:3, you will need to make 50% of profitable trades to be only in the black. 50% of profitable trades is an indicator of very good traders. On the basis of historical data, it is important to consider the chances of this or that size of movement in the instrument. In the course with the help of statistics analysis of volatility index S&P500 is shown that in 80% of days to earn intraday trading is very difficult. Also, you still have big risks in the distribution tails areas. There are days that can cause noticeable damage to the account. Approximately 1 day out of 100, the S&P500 has movements of more than 3%. Shares in the S&P500, repeat the situation with the index S&P500. It is similar situation with currencies. For example, analyzing the GBP/USD pair, in the course is shown that in half of the day prices fluctuate from -0.25 to + 0.25% of revenue per day. If you consider the commission, then it is problematic to earn within a day, buying at the opening and selling at the closing. On a usual day, opportunities for day trading are very small. That is why you need to expand the time interval of trade and shift the probability of earning in your favor. Also, in the course is given example of the calculation of the ATR tool based on historical data from open sources. You need to know what intraday movements you can count on, what risks can be in the tool. The volatility considered is the historical volatility of the instrument. Further in the course, is shown future volatility. For the S&P 500, this is the VIX expected volatility index, which is calculated at option prices that reflect market expectations for future volatility. The VIX should be considered as traffic lights. It says, when you need to engage in day trading, and when to trade a portfolio. You have a portfolio formed with a certain volatility. You need to monitor how volatility changes over time. For example, if VIX increases by 25%, then you can get rid of half the positions in the portfolio. An important thought that the author of the course wants to convey to us is that when the volatility increases, the risk of the portfolio also increases linearly. If you have a position of 1 million and VIX doubles, then your million turns into 2 million, as fluctuations in profits and losses of portfolio have doubled. If volatility rises, and you do not close part of the positions, then your risk grows uncontrollably. If volatility increases (plus 25% of the average annual VIX value), then short-term opportunities at the market grow, and you begin to free up capital for day trading. Day trading in the course means the retention of positions during 1-5 days. If VIX falls (minus 25% of the average annual VIX value), you need to collect a portfolio of positions. Also, in the course is given an example of calculating the index of future volatility for any instruments in your portfolio, for which there are options. When we have historical and future volatility, then we can see the whole picture, we begin to understand what the instrument is. Common mistake traders make is that they tell the market that they will trade in a certain way, despite the fact that the market is changing. You need to change the style of trading depending on the volatility. However, there are no clear rules of how to do this. It all depends on whether you are better at: trading a portfolio or short-term positions. Proceeding from this, you choose proportions in long-term and short-term trade. It is not necessary to go from one extreme to the other. The course involves the organization of systematic, repeatable processes in your work on market analysis, the search for trading ideas. If you want to develop in the field of trading and in the future, for example, to attract investors’ money, then investors will be interested in how your strategy works. Systematic processes are needed in order to protect the money of investors. Investors are interested in protecting the value of their money, protecting against inflation, hedging in different markets. They are interested in stable profit making with low volatility. No one is interested in investing in trade, which brings in one month + 10%, and in the next month gives -10%. Investors who understand finance and markets will not give money, for example, for day trading currencies. This course assumes a diversified approach to the formation of a portfolio with moderate volatility and an upward trend in profitability in any situation. 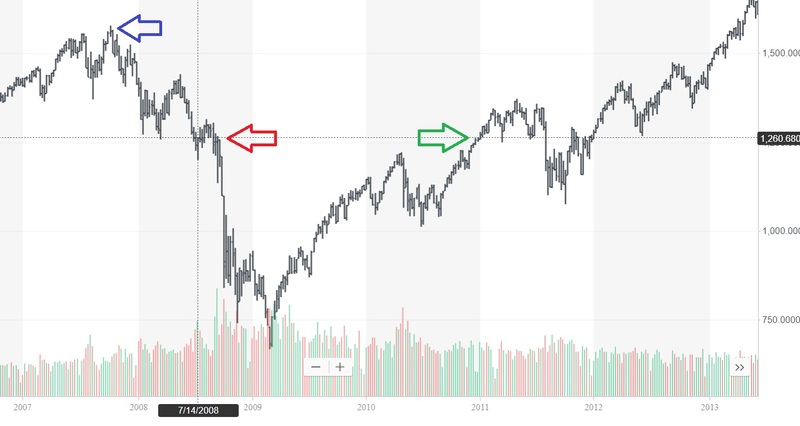 According to the S&P 500, high was at 1576 point in July 2007. 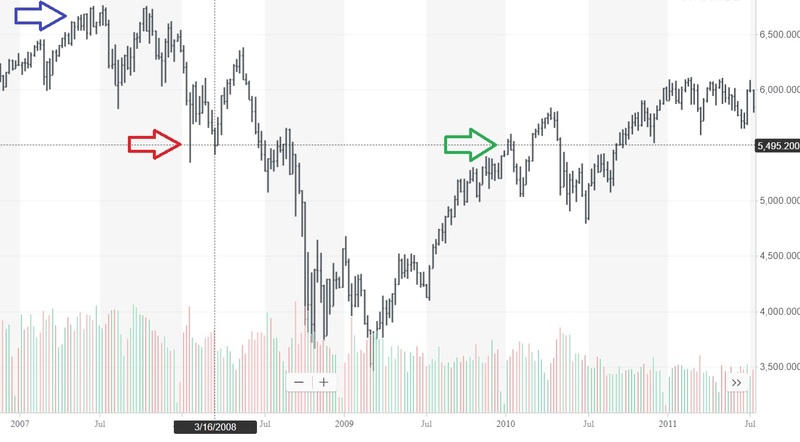 Minus 20% of this high was 1260 point in June 2008. After that, the market is considered bearish. The market began to be considered bullish again when it overcame the 1260 point in January 2011. This is an important point. FTSE 100 includes companies that are sensitive to business cycles. The idea is to form a portfolio of instruments that are sensitive to business cycles and are not sensitive, depending on the bull market or the bear market. You need to focus on sectors that are more sensitive to business cycles and which will give more revenue than just investing in the market index. If we are positive about GDP and think that it will go up, then we buy cyclical sectors (sensitive to business cycles) and sell defensive (not sensitive to business cycles), and if we assume a reduction in GDP, then we buy defensive sectors and we sell cyclic. We will come back to this topic below. Now we will consider the question of what drives the markets and whether these movements can be predicted. Markets are driven by GDP dynamics of countries. First of all, this is the GDP of the USA, China and Europe. If we can predict the GDP of these regions, then we will have a very clear picture of the world economy. Statistics correlation of GDP and S&P500 for the past 60 years is as follows: S&P500 in 59.59% of cases (quarters) is growing along with GDP. In 7.76% of cases, they fall together. 67% of the time they move together. GDP explains the movement of S&P500 in 67% on a quarterly basis. This means that the chances are on our side if we can correctly predict GDP. If we predict correctly in 3 out of 4 quarters, then we will be right in 75% of cases. The problem is that in reality the S&P500 index is ahead of GDP statistics for 3-6 months. When statistics on GDP is published, it is already very outdated information, on the basis of which it is impossible to trade, and you cannot trade on news in the media. But there is statistics that is really useful and predicts GDP for 12 months, and the S&P500, respectively, for 6 months. This is the statistics, which is made by The Institute for Supply Management. PMI and the indicators included in the ISM are leading indicators in relation to the S&P500. They reflect business cycles. When the ISM goes down, in 12 months the GDP is reduced. Although PMI reflects a small part of the economy (20%, manufacturing companies), it is interesting because it has statistical data since 1948 which can help to trace the patterns of influence of this indicator on GDP and index. According to data from 1948 ISM correlates with GDP in 85% of cases with a lag of 12 months. If the ISM is above 50% and is growing, then it says that the US economy will grow in 12 months, and we are leaning towards long positions. If it is more than 50%, but slows down, we can have a flat portfolio, or we can close positions. When it falls below 50% and declines, the US economy will decline, and we tend to short positions. If the ISM is below 50% and grows, then we tend less to shorts, we are in a flat or close positions. In addition, in the ISM reports we receive a qualitative assessment of experts from the companies surveyed. This is a good material where you can take ideas for trade. From comments of experts it is possible to understand, what sectors will grow, and what will fall. Expert estimates predict the profits of companies. The most sensitive indicator of the ISM report is the statistics for new orders. New orders are the leading indicator for ISM. But the problem with ISM is that ISM predicts too early. We can go into too early, when the market has not spread yet, and we can lose money during a couple of months. ISM gives the original idea (not a trade) of what will happen to the US GDP in 12 months. To determine the exact time of entry, you need additional indicators. It is necessary to agree the time of the transaction. This is done using technical analysis, which we will discuss below. Also worth mentioning such advanced indicator as the NMI indicator for the service sector. The service sector is 80% of the US economy. The meaning of the indicator is the same as for ISM indicator. We watch: it is higher or lower than 50%, what is its dynamics. It is useful to observe how the NMI and ISM indexes relate to each other. Indicators, which we examined above, belong to the sphere of production. For completeness, we still need to consider indicators related to consumption. The leading indicator related to consumption is the Consumer Sentiment Index of the University of Michigan (UMSCI). The indicator has 80-85% correlation with the business cycle, with a time lag of 12 months. The average value of the UMSCI index is 85. If the indicator is between 60-70, then the mood of consumers is negative, if the indicator is between 70-80, then the situation is neutral, and if the indicator is above 80, then the indicator is optimistic and the long-term growth of the US economy is expected. Level 85 coincides with the long-term economic growth of 3%. If the indicator is below 85, then you can expect growth of less than 3%. Using ISM, NMI and UMSCI, you can get a clear picture of the well-being of the US economy and get the right direction. Another leading indicator, which should be mentioned, is the statistics on the number of applications for new construction in the US. The number of applications for new construction is a very important predictor. It reflects the well-being of the mortgage market, the commitment of banks to issue loans. This indicator is also associated with sectors of timber, builders, steel producers, paints, furniture manufacturers, banks. The lagging indicators in this sector are Pending Home Sales, New Home Sales, Existing Home Sales, The Case Schiller Index, The Housing Market Index. They will confirm or deny your ideas. As for the leading indicators, I would like to say one more important thing regarding day trading. Trading within a day is also necessary on leading indicators, and only when volatility allows it. Most retail traders trade everything, any statistics, both leading and confirming, and lagging, without making a difference between them. If you are trying to trade within a day at the time of the release of lagging statistics, then you simply provide liquidity to those who close positions that were opened several months ago in accordance with leading indicators. We verify the correctness of the implementation of ideas using coincident indicators. Coincident indicators do not predict the future, but tell us what is happening with the economy now. For example, a coincident indicator is the unemployment report. For the growth of the US economy by 3%, is needed an increase of minimum 250-300 thousands new jobs. At the peak of business cycle, when the economy is growing, fewer positions are added. The next confirmatory indicator is durable goods and a report on their deliveries. The indicator for durable goods should be cleared of the influence of the defense sector and the transport sector,as one large order can greatly affect the performance. This report will confirm or disprove what you saw 12 months ago in the ISM production report. These reports confirm or disprove data on PMI and GDP. Another confirmatory indicator is the Industrial Production Index. INDPRO will help to understand what is happening in different industries. It also confirms or disproves data on PMI and GDP. The indicator of industrial production is a continuation of what we believe based on the PMI data, which we analyzed 6-12 months earlier. Coincident indicators exist not for making decisions on the opening of positions. Positions are opened long before the entry of these indicators. They only confirm or disprove the correctness of previously made decisions. In most cases, these data are already taken into account by the market. – ISM Manufacturing Index, ISM Non-Manufacturing Index, University of Michigan Consumer Sentiment Index, Authorized Building Permits, Money Supply (M2), Yield Curve (Interest Rate Expectations). – Producer Price Index (PPI), Consumer Price Index (CPI), The Employment Situation Report (Non-Farm Payrolls), Jobless Claims, Industrial Production, Durable Goods Orders, FOMS Meetings, Personal Income, Factory Orders. – Gross Domestic Product (GDP), The Unemployment Rate (NFP Report), Federal Reserve Beige Book, Retail Sales. We examined indicators for the US economy. Now let’s move on to European indicators. The most important European leading indicator is Economic sentiment indicator (ESI). It is a survey of economic sentiment. ESI predicts future European GDP for 6-18 months. An average of 12 months. – BUIL – an indicator of confidence of real estate developers, similar to building permits in the US, but at the same time includes industrial and commercial construction – 5%. There are ESI reports separately for European Union countries, from which one can understand condition of economies of these countries. It is possible to distribute countries from the best, with a growing economy, to less successful ones. Accordingly, appear ideas to take shares from a country with a growing economy in long, and with a falling economy in short. For 4-12 weeks. For example, to form a portfolio of 10 shares in long and 10 in short. Take the statistics from ec.europa.eu and sort the countries whose index has grown the most and least. Sorting is made by sectors of the economy. This information is the basis for trading ideas. For example, we look at the country and sectors where the index is highest and, accordingly, the shares of companies from this country and from this sector will be interesting for opening long positions. We also look at the country whose index is the worst, and we also select sectors and shares from these sectors to open short positions. We look at the dynamics of indicators, if they slow down or accelerate. For you it will be a repetitive, monthly process, because statistics is published monthly. – Construction Confidence Indicator – 5%. – Industrial Production, Monthly Inflation Numbers, ECB Meetings, BOE Meetings. – GDP, Unemployment, Retail Sales. Now let’s look at statistics of China’s GDP. The USA, Europe, China are 50% of the world economy. In China, we have official statistics and private statistics. There are two indicators that predict China’s GDP. Official PMI and HSBC China PMI. HSBC China PMI is the PMI of the private sector. Professional traders align more with HSBC PMI, as there is not enough trust to the official PMI. In addition, the official PMI is too slow. It includes top 300 Chinese companies, while HSBC PMI includes medium and small companies that are more sensitive to changes in the economy. You also need to know the specifics of China’s economy and stock markets. In China, the structure of the market differs from the US and Europe. There is no developed pension system in China and pension funds are not invested massively in the stock market, i.e. there is no constant inflow of funds from buyers. People invest in tangible assets. Therefore, China’s stock indices cannot be traded on the basis of PMI data. Chinese indices do not predict GDP. Do not trade Chinese companies and indexes directly. It is better to trade companies that are traded on Western exchanges, but whose profit depends on China’s economy. Or, for example, if you take a country whose economy is largely based on Chinese demand (for example, Australia). If the growth of the Chinese economy slows down, then this country’s export falls and, accordingly, the exchange rate falls. We need China’s PMI statistics for forecasting China’s GDP. We also need to compare Chinese PMI with the fundamental indicators of the US and Europe, because export composes 30% of China’s GDP, while export to the US and Europe composes more than 30% of China’s total export. If there is decline in US and Europe, then it will be difficult for China to grow. There are many companies whose profit depends on Chinese demand. For example, mining companies. You can form ideas for exchange products, companies, countries that are connected with the market of China. – Total Floor Space Started – 1,8%. – Industrial Production, Monthly Inflation Numbers. The news flow is equally used for both portfolio trading and for day trading. Never open positions for matching and lagging indicators. This is all the old news, which trade most retail traders. You need to understand how the outgoing statistics affects stocks, commodities, bonds, and currencies. For example, the growth of Manufacturing ISM will lead to an increase in stocks, commodities, while bonds and the dollar will go down. This is how trading ideas are formed. Above we reviewed statistics, which helps to understand the situation in the market as a whole. We are still at a macroeconomic level. According to the scheme, which was higher, after we agreed the direction of the market, we move to the level of industries. We will be interested in sectors that will surpass the market. We do not need sectors that are worse or the same as the market. We want to exceed the market’s profitability. As I wrote earlier, you need to concentrate on sectors that are more sensitive to business cycles and which will yield more revenue than simply investing in the market’s index. If you are confident in GDP growth, then you can buy assets that are sensitive to business cycles. You will have a portfolio of cyclical sectors with positions in long and defensive sectors with short positions. If you assume a reduction in GDP, then you buy defensive sectors and sell cyclical ones. – Utilities (Gas, Water, Multi). If you have a long of one company and short of the other in the same sector, then you have hedged the market and sector risks. There can be different combinations: shares from different sectors, from one sector. Accordingly, the risk size varies. If shares are from different sectors, then we do not have a market risk, but there is a sector risk. It is necessary to study in detail each sector, its specifics, relationships between companies, value chains. From the sector level, we go down to the stock level. To assess the quality of shares in the course, it is suggested to use the P/E (price-to-earnings ratio) and PEG (price/earnings to growth ratio). The price/earnings ratio reflects the quality of the company’s profit. We look at the P/E of sector as a whole and the P/E of specific stock. We are interested in whether the stock is traded at a discount to the sector, or vice versa, its P/E is above the average for the sector. You also need to watch how share’s P/E changes over time. All the data on the share has already been taken into account in its price and in P/E ratio, so there is no need to argue with the market. Even if you think otherwise, the market may remain irrational much longer than you can be solvent. Nothing is either cheap or expensive. P/E reports all the information that is needed. If P/E is low, then there is a reason for this. The seminar shows in detail the algorithm for analyzing public data to find high-quality shares in the right sector with high growth rates of profit, P/E and PEG ratios. If we are looking for position on long, then we are looking for P/E with a premium to the sector, and if short positions, we are looking for tools with a discount to the sector. High P/E means that the market is ready to pay for high-quality profits, and low P/E means that the market punishes the company’s shares with low price for profit with low quality. There is no need to go against the trend and against the valuation of the share by the market. Similarly, we act with PEG, selecting for long papers with a coefficient greater than one and for shorts with a coefficient of less than one and low growth rates. Do not follow the idea of buying “undervalued” companies, in which PEG is less than one. They are “undervalued” for some reason. The market will reward companies with larger rate of earnings per share growth than the industry average and punish companies with lower growth rates. Further, the selected shares are combined into spreads, a spread schedule is constructed, to which the technical analysis tools are applied. To enter the position, you need to focus on the spread indicator, and not on the charts of individual shares. – 250 – number of trading days per year. We watch how fast lines cross the slow, where the moment is directed. In the technical analysis, is also used RSI. Subject of technical analysis is the shortest in the course. The course gives a good idea of what the trader’s job is. Very often you can find seminars, books, in which the emphasis is on technical analysis, indicators. This seems simple and understandable to the masses, because these are not complex calculations in Excel. But as you have already seen, technical analysis is a small part of the trader’s work, and ideas for trading are not taken from it. This is just an auxiliary tool for finding the right time to enter, to select the best ideas from watchlist on the basis of analysis of the spread schedule. The last topic of the course is the topic of risk management. There are many calculations in Excel on this topic in the course. If I describe everything, then the article will turn into a book. 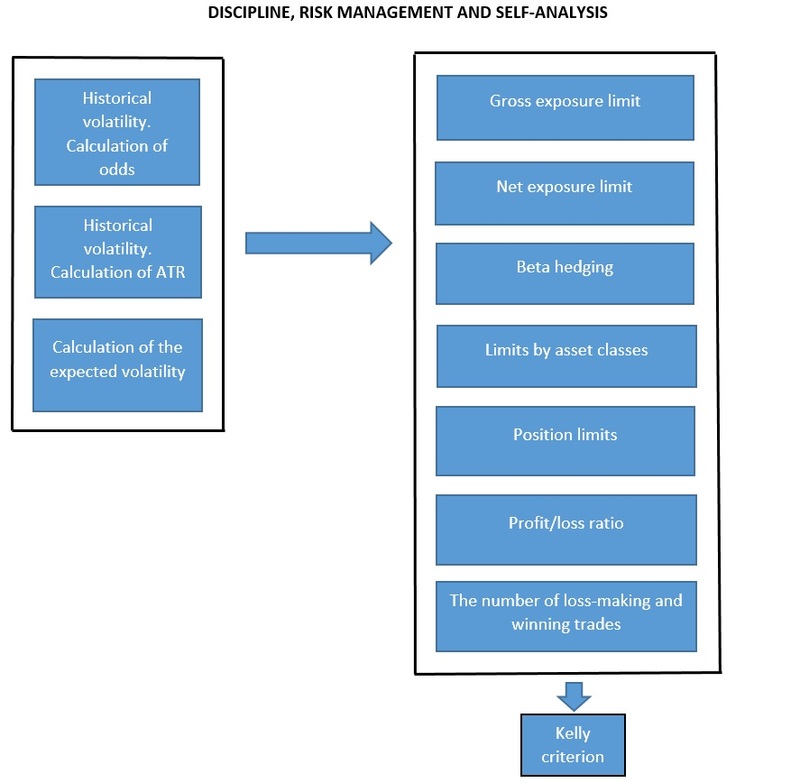 The course covers in details the procedure for calculating and monitoring the risk of the portfolio, how to form watchlist and select deals from it. Your watchlist should have 3 times more ideas than your portfolio. Weekly, you track your ideas and update information on prices, spreads, wait for the transaction to begin to match technical indicators (technical analysis, I repeat, applies to spreadsheets), and select deals that begin to work. Next, we consider how to calculate the stop in spread transactions, taking into account ATR tools. The task is calculation of such a stop, which, on the one hand, allowed to hold the position for a long time, and at the same time would not be too large. Stop is calculated on the spread. It is recommended to put a stop-loss of 7-12% on the spread. You cannot put stops on individual stocks. You cannot close a position on one of the spread shares. It is necessary to cover the whole pair. If you close half of the spread, then the second half has market and sector risks immediately. The basic approach to stops is a hard stop-loss and trading stop on winning trades. In winning trades, you use a trading stop and hold the position until you are knocked out by the stop. In other words, you severely cut the losing trades and squeeze the most out of the profitable. If possible, then add volume to the winning trades. The hedging of the beta spread is also considered at the seminar. It is necessary to take into account at what speed the stock moves relative to the market. If this is not taken into account, then the pair will be unbalanced and the transaction will have market risk. If the beta pair is more than two, then this idea will require more capital. You need to look for more effective hedges with smaller beta, which will not freeze capital. The course provides an example of a complex hedge model of two pairs of shares. The calculation of the distribution of capital by shares is carried out, depending on the beta of each share. Also, is considered an example of independent calculation of beta shares, an example of hedging currency risk in transaction, details of money management issue are discussed in detail. Separately, is considered indicator of the trader’s work as Kelly criterion. The meaning of this criterion is that when we win, we take more risk, and when we lose, the risk is reduced. It is considered how to calculate Kelly criterion for each transaction, for portfolio trading and separately for day trading. The issues of risk management and money-management are given quite a lot of time in the course. All these topics cannot be put in one article. They need to be studied in detail and examples of calculations in Excel should be mentioned. If you are interested in this style of trading, then I would recommend watching a video of the course. There are also many templates and examples of calculations included to the course. Even if you do not use hedge fund strategies, this course will be useful for you because it gives an idea of the essence of the trader’s profession in such firms. Maybe one day, when you get tired of viewing graphics and wasting your time and money on experiments with various indicators of technical analysis, you will tackle the more complex and forward-looking strategies described in this article.